Since I finally finished painting my flag, the table was cleared and in need of a centerpiece for Easter. I got out my Easter items and had them spread out on the dining room table in the basement, but I just didn’t see anything I wanted to use as a centerpiece. Then I started putting away the St. Patrick’s Day decorations downstairs. On the shelf next to the stairs, I had a collection of vases on a green table runner with light green glass rocks strewn all around them. As I was picking up the rocks, I noticed darker green striations in the glass. It reminded me of the striping in a green flame-less candle I recently purchased. Those two items were the inspiration for my centerpiece. 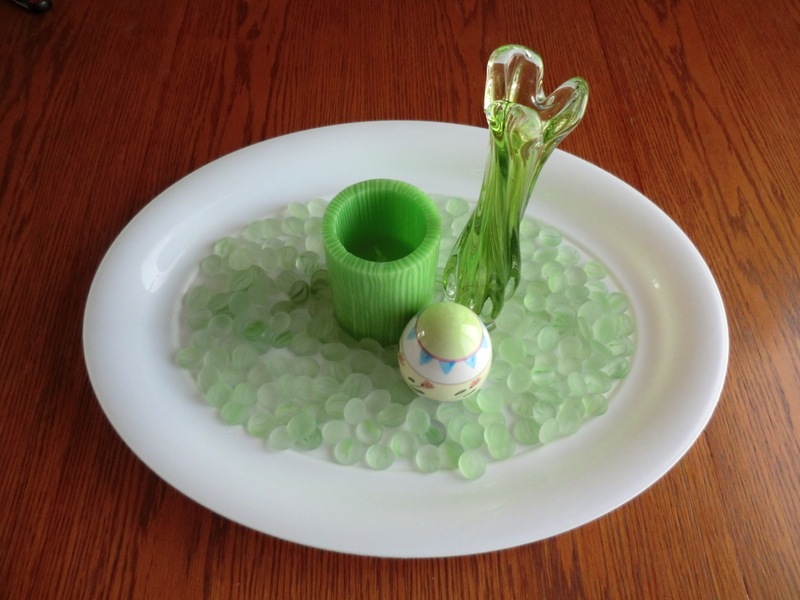 I added a green vase that looks like a flower before the bloom appears and a glass egg because the top was painted green and I had my Easter centerpiece! My Easter centerpiece, whose inspiration was the striations in the glass rocks. This entry was posted in Decorating, Make It, Use What You Have and tagged Make It, Use What You Have by Frugal Fish. Bookmark the permalink.